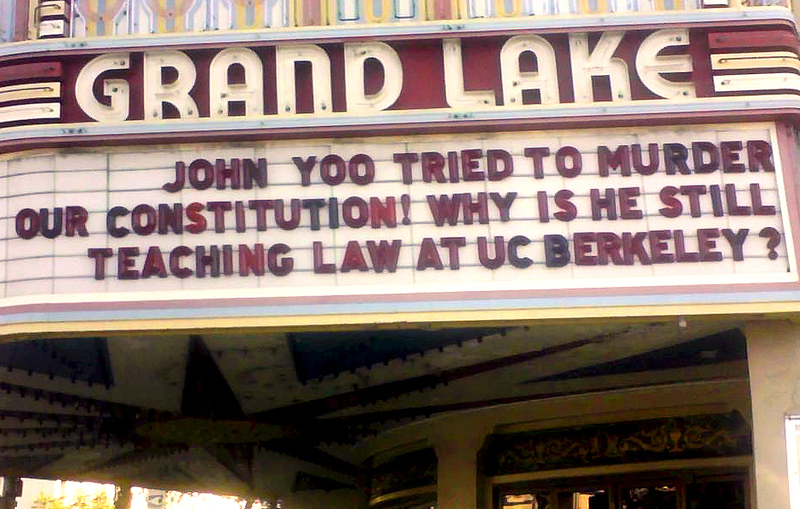 John Yoo authored song Lyrics for "The Torture Memos" music performed by the Parkdale Revolutionary Orchestra - FIRE JOHN YOO! Get Adobe Flash Player to listen. From the website; "We just released our new recording of the Torture Memos: a musical reworking of the legal documents that attempted to justify torture. The text is all by John Yoo and his cronies at the U.S. Department of Legal Counsel, taken directly from the documents with no alterations, additions, or misleading combinations. This music says exactly what these criminals intended to say....In lieu of paying our "lyricists" we're donating 15% of the sales of this record to the American Civil Liberties Union." The singer Kristin Mueller-Heaslip said in an email to firejohnyoo.net; "...we definitely want to keep the Torture Memos project moving forward. There's been a fantastic response every time we perform it, and the music brings out the banal evil of the text like nothing else can. We're thinking of organizing a US tour, assuming of course that we can get across the border." Listed below are links to blogs that reference this entry: John Yoo authored song Lyrics for "The Torture Memos" music performed by the Parkdale Revolutionary Orchestra. This page contains a single entry published on February 10, 2010 10:30 AM. "It is the essential role of the judicial branch to prevent the 'war on terror' from becoming the blank check for official torture that Yoo and the United States (Justice Department) seek" was the previous entry in this blog. "embarrassing and shaming" torture secrets revealed... is the next entry in this blog.